As the ‘principal speaker’, Professor Gabai gave three consecutive lectures on his ending lamination space paper (this paper was also mentioned in my last post). I would like to sketch some little pieces of ideas presented in perhaps couple of posts. Let denote the (hyperbolic) surface of genus and punchers. There is a unique geodesic loop in each homotopy class. However, given a geodesic loop drew on the surface, how would you describe it to a friend over telephone? Here we wish to find a canonical way to describe homotopy classes of curves on surfaces. This classical result was originally due to Dehn (unpublished), but discovered independently by Thurston in 1976. For simplicity let’s assume for now that is a closed surface of genus . Fix pants decomposition of , is a disjoint union of ‘cuffs’. Around each cuff we may assign an integer twist number, for a cuff with intersection number and twist number , we ‘twist’ the curve inside a little neighborhood of the cuff so that all transversal segments to the cuff will have intersections with the curve. Theorem: Every simple closed curve is uniquely defined by its intersection number and twisting number w.r.t each of the cuffs. 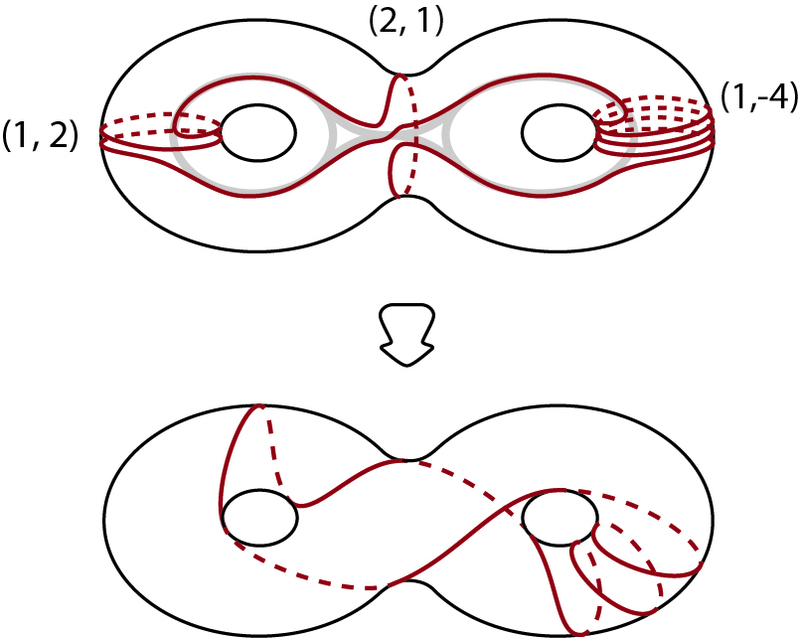 Conversely, if we consider multi-curves (disjoint union of finitely many simple closed curves) then any element in describes a unique multi-curve. In the example above our curve was homotopic to the curve . In other words, pants decompositions (together with the associated 0-twist arcs) give a natural coordinate chart to the set of homotopy class of (multi) curves on a surface. i.e. they are perimetrized by . In fact, this kind of parametrization can be generalized from integers to real numbers, in which case we have measured laminations instead of multi-curves and maximal train trucks on each pants instead of canonical untwisted arcs. i.e. Theorem: (Thurston) The space of measured laminations on a surface of genus is parametrized by . Furthermore, the correspondence is a homeomorphism. As we can see, just as in the case of multi-curves, any triple of real numbers assigned to the cuffs can be realized as the weights of branches of a train track on the pants.